We would like to introduce a NEW flint to our range of decorative shingles. MOBEN FLINT. Its mixture of irregular but smooth edged shapes, colours and textures, giving it a very impressive appearance. And like the other products in the range are commonly used for driveways, footpaths and landscaping purposes. The range also includes Golden Flint, a selection of Quartz, a variety of Chippings popularly known as ‘Oxford’ and ‘Cotswold’ Shingle. 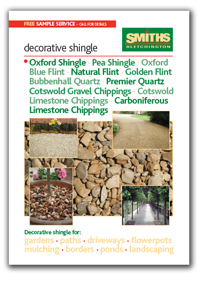 All our decorative shingles are sourced from our own ‘Gill Mill’ and ‘Duns Tew’ quarries. Most of these products come in a selection of sizes (ranging from 6mm to 40mm). We can deliver any products from this category in bulk load or in smaller bags to any postcode in the country. For further information, please view our article about decorative aggregates or contact us. Please be aware these are natural products and as such, colour variations may vary. 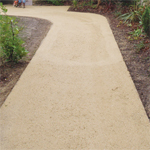 For driveways, footpaths, borders and general landscaping. Uses include driveway and general landscaping, drainage and pipe bedding. Pea shingles have many different uses. Perhaps one of the most popular is decorative.